Two weeks after Chinese President Xi Jinping reiterated China's plan to begin liberalizing its automobile market by lowering tariffs on imported cars - dealing what could be a death blow to the government's strategy of forcing foreign manufacturers to enter into profit-sharing (and intellectual property sharing) agreements with local manufacturers, just to gain entry to the mainland market - senior officials at the State Council, China's cabinet, are saying the lower tariffs could be announced as soon as next month, according to Bloomberg. Xi isn't the only senior Chinese official to speak on the issue. Back in January, Chinese Premier Liu He promised his audience at Davos that the tariffs would be lowered. 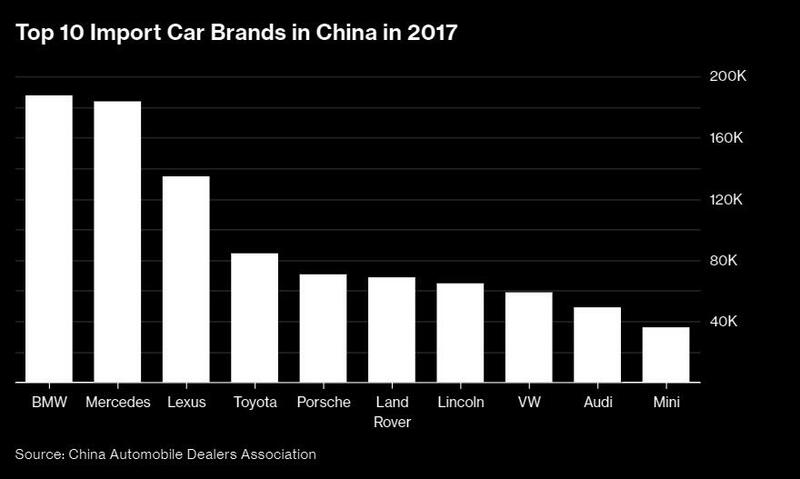 High-end brands like BMW and Lexus have the most to gain from lower tariffs in China because they often don't have a manufacturing presence in the country, which means their cars face the full 25% import tariff. The move comes as investors and executives fret about a trade war between China and the U.S. China has responded to U.S. President Donald Trump’s tariff threats with similar force -- though at the same time it has signaled opening up its finance and auto industries. Trump said on Tuesday that Treasury Secretary Steven Mnuchin will depart for China within days. A lower tariff would also benefit brands such as Daimler AG’s Mercedes-Benz and Volkswagen AG’s Porsche as their imported models would become more competitive. Elon Musk will likewise be delighted if this report is true. And this isn't the only major policy change China is considering. China last week said it planned to allow foreign automakers to own more than 50% of domestic factories. But despite President Donald Trump's delight earlier this month when Xi mentioned lowering the tariffs - which Trump mistakenly interpreted as an olive branch in the burgeoning trade war between the two countries - US carmakers might still face scrutiny. China is threatening to slap an additional 25% import duty on cars made in the US. Higher tariffs on US cars would be particularly bad news for Tesla CEO Elon Musk, who has reportedly been trying to build a Tesla factory in Shanghai's free economic zone. Musk hailed Xi's announcement as a "very important action by China." Still, imports only comprise a small part of the Chinese market. China imported 1.22 million vehicles last year, or about 4.2% of its total.